Find your Word Swipe answers here. We have every solution for this game to solve your level. This great puzzle game can be hard to play but we are here to help you with that. Select your level below to get the Word Swipe answers. Just swipe the words in the same order so you are sure you can swipe the next word. This is necessary to let the letters drop at the right position. If you can’t find your level or when you see any incorrect words in our list then leave us a message at the bottom of this page. And if you found your Word Swipe answers then we would be happy if you can give us a Like! 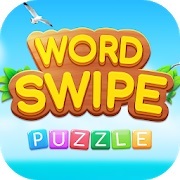 Word Swipe is currently very popular and you should really try it if you love word puzzle games. If you haven’t got this game yet then you should download and install it. 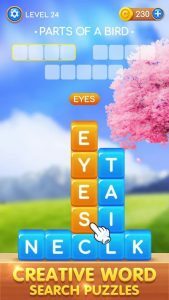 The goal at this game is to find all the words in every level. You need to swipe the letters in the right direction to create a word. When you’ve found a word, the selected letters will disappear and the letters above it will fall down. You need to do this until you’ve found all the words. Before every level starts you will get a clue about the topic of the words you need to find. There are some bonus words available that will give you extra coins. These coins can be helpful if you wish to use hints. But with our list of Word Swipe solutions you won’t need them. If you like Word Swipe (or if you don’t) then let us know! We want to hear from you so we know we helped you with all your Word Swipe solutions. It will keep us motivated to update this page with the newest words for the game. all I have for level 364 “words in cruel” are c’s, e’s, l’, and u’s…that’s why the answers are NOT the correct words for that level.